The Energy Code Voting Process Has Begun. Is Your City Ready? This recap of the IECC code process is an important reminder: Understand the issues at stake and don’t forget to vote! The International Energy Conservation Code (IECC) addresses the energy efficiency in the design of building envelopes and systems. No matter what town or city you are in, it likely enforces a version of the IECC—most cities and states adopt the IECC as is, or a version that is based on the code. This means updates to the IECC have a direct impact on the majority of the buildings we live and work in. Every three years, the code is updated through an open development process. Right now, cities across the U.S. are back in the thick of that process, as proposals for the 2021 IECC were due into the International Code Council (ICC) via its cdpAccess portal on January 14. Now, we wait for the hundreds of proposals to be released. These members can represent building departments, sustainability offices, fire districts, and other entities that write and enforce local laws as defined by the ICC. Each Governmental Member is assigned a number of voting representatives (GMVRs) based on the population of their city. GMVRs are the only individuals who can vote at the ICC hearings or during the online voting period that occurs after the in-person hearings close. For every code development cycle, it is critical that local government representatives renew their membership, register their Governmental Members, and put a plan in place to vote. In the last cycle, only 1,552 voters participated. Each city receives between 4—12 votes, which means less than 400 cities voted in the last cycle. For context, there are 35,000 cities and towns in the United States recognized by the U.S. Geological Survey. 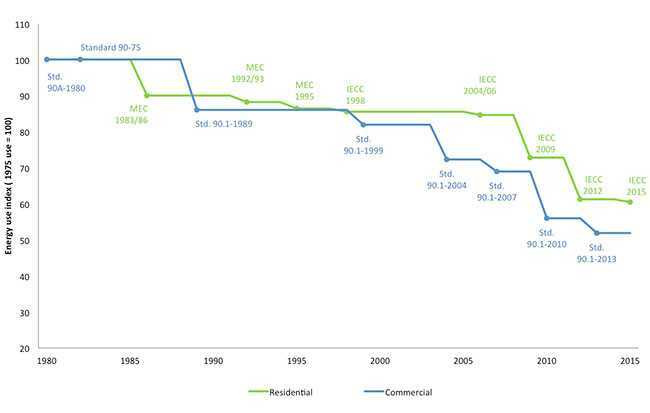 Over the last 35 years, the energy code has seen a lot of changes, and a great deal of progress to achieving higher performing buildings. For example, from 2006—2012, we saw a 30 percent increase in the efficiency of buildings that meet the 2012 code requirements (see graphic below). As for the energy code updates between 2018—2021, anything could happen. Buildings in the U.S. still use more total energy than most countries, so there is room for improvement. In addition to ensuring buildings are designed and constructed to be significantly more energy-efficient and higher performing overall, they also play a critical role in driving better safety and resiliency, which I covered in my previous blog. As cities set ambitious goals around carbon reduction and renewable energy, it is critical that we start with the code that governs our new construction and renovations to our existing building stock. Be sure to follow the key dates for the 2021 IECC Development on the ICC website. Need a place to start? Don’t forget to join ICC or renew your membership by March 29. To learn more, attend this free March 5 webinar hosted by the New Buildings Institute and the Energy Efficiency Codes Council to hear from other experts working on the 2021 IECC update. And check back here on IMT’s blog this April when I’ll share more on the energy code development process, as well as my insights for what to expect at the ICC Committee Action Hearings scheduled for April 28 – May 8, 2019. Kim Cheslak is IMT’s Energy Codes Specialist. This article first appeared on imt.org. It was re-published with permission.